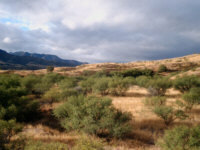 Stevens Canyon - Santa Cruz County, AZ - Headquarters West Ltd. 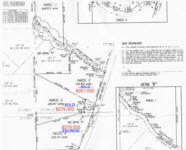 Note: We've also listed 5 14-20 acre lots nearby, ranging from $189K - $249K as well as the 840 acre Sonoita Creek Ranch nearby. 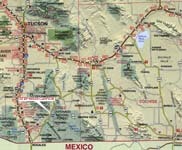 The property is located roughly ½ mile northeast of Patagonia along HWY 82 and 66 miles southeast of Tucson, Arizona. 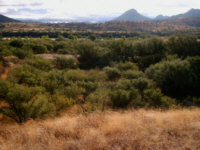 The property is nestled in the beautiful foothills of the Santa Rita Mountains and is near the Coronado National Forest. Please see the parcel map above for the specifics. Summers and winters are comparatively mild, temperatures vary from a daily maximum mean of approximately 58 degrees during the month of January to a daily maximum mean of approximately 88 degrees during the month of July. 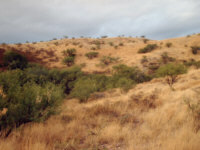 Annual rainfall averages about 17 inches. 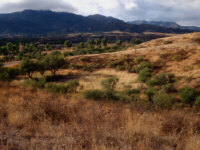 Wildlife include mule deer, white tail deer, bobcat, mountain lion, javelina, coyote, fox, badger, and squirrels. 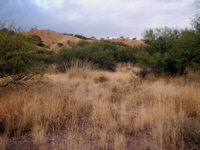 Quail and a wide variety of birds and other small game reside here. 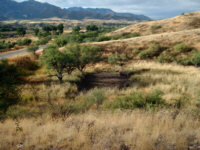 The Sonoita-Patagonia area is widely recognized in Arizona for its natural beauty and world-renowned bird watching. The small picturesque town of Patagonia located just south of the property offers public schools with education from kindergarten through high school. 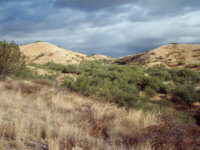 Nogales International Airport is about fifteen miles from the ranch, and Tucson International Airport is a little over an hour's drive. Please click here to download (about 300kb) a printable brochure in Adobe Acrobat format. If you get frustrated trying to make this work on your computer, don't hesitate to ask us to mail you a printed and bound brochure instead.